Expectant mothers won’t just be noticing mood swings, big bellies, and swollen ankles during their pregnancy. In order to prepare for impending birth, multiple body systems undergo profound, if temporary, changes to accommodate this new addition. These alternations range from hormonal changes to memory loss and organ functioning. Since skin is the human body’s largest organ and hair is dying skin, hair changes are not uncommon during pregnancy. There are a variety of these pregnancy hair changes as well. Most women will suddenly be gifted with full, healthy, very vibrant locks. Other expectant mothers may experience Telogen effluvium or abnormal hair loss during pregnancy, though this is more likely to be seen immediately after delivery. And some expectant mothers may wonder what all the fuss over hair and pregnancy is about because they’re not seeing much difference themselves. Both hair growth and loss in women are affected by the hormone known as estrogen. During pregnancy, a woman’s estrogen levels rise. A healthy pregnant woman should expect to see a full, very healthy head of hair. In fact, women who suffer from hair loss disorders such as androgenetic alopecia will often have their hair restored to them during or after the course of their pregnancy. 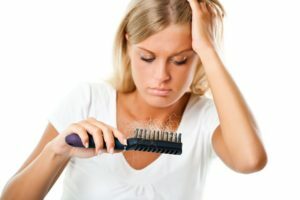 But this hair bonanza isn’t only limited to the top of the head, and pregnant woman often find themselves having “hair eruptions” all over the body, such as face and abdomen and sometimes embarrassingly so. Ironically, these increased estrogen levels aren’t having your body produce more hair. Instead, it’s slowing down the body’s hair growth/shed cycle. As a result, your body retains hair to a degree that it wouldn’t normally. And more hair isn’t the only thing that pregnant woman might notice. Hair color and texture might also change during pregnancy. While excessive hair growth ends with the pregnancy, for some women these other changes are permanent. Your straight hair is noticeably curly? Those blonde locks are definitely darker? And that usually beautiful, shiny hair is now limp and greasy? None of these new “looks” are any reason for concern during a pregnancy, and will generally end when the baby is delivered. After delivery, as the body’s estrogen levels and hair growth/loss cycles try to return to normal, most women notice sudden hair loss and brittle nails that easily split. Nail and hair loss at the end of a pregnancy are perfectly normal, but for most women, to experience this during a pregnancy is not. The reasons for these losses during pregnancy are most commonly mineral and vitamin deficiencies. Other, more serious causes of pregnancy hair loss include hormonal imbalances and the loss of the pregnancy itself. If an expectant mother is experiencing abnormal hair loss during pregnancy, a doctor’s visit is recommended. Things aren’t any more normal for a pregnant woman’s hair than the rest of her during gestation. While pregnancy’s effects are usually temporary for hair and nails, they can be lessened by eating fruits and vegetables rich in flavonoids and antioxidants as well as consuming doctor approved levels of vitamins and minerals. Iron deficiency during pregnancy may also be to blame for some cases of hair loss during pregnancy. In this case, an appropriate iron supplement could help. Women can also avoid activities that normally stresses hair such as hot rollers, hair weaves and combing and brushing hair while it is wet. In general, hair care is very important during pregnancy. Be sure to use a mild shampoo while washing your hair. For dry hair, regular hair treatment is recommended. 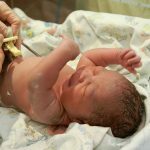 While hair treatments such as coloring and perming involve strong chemicals, the limited amount of contact they have with expectant mothers’ skin isn’t believed to cause harm to unborn children. To be safe, however, it’s suggested that expectant mothers wait until the second trimester to have such processes done. They should also be done in a well-ventilated area, and if the mother herself is doing this, she should wear impenetrable gloves while using these chemicals. There are now a number of milder products on the market to consider like henna, temporary highlights and vegetable dye. In these cases, you can use certain herbs such as chamomile, sage and other fruits and vegetables to dye your hair on a natural basis. Finally, pregnant women should expect a dramatic loss of hair, called postpartum effluvium, anywhere from three to six months after the birth of the baby. This is a sudden, large loss, and it can upset many women. But they shouldn’t worry, as that hair will grow, right along with their baby.